11/29/2011 – The free day (December 7th) at this event is filled with special activities: at 2.30 p.m. the ChessBase "Geek in Chief" Nick Murphy gives a workshop; at 4 p.m. there's a screening of the award winning documentary Bobby Fischer against the World; and then at 7 p.m. John Nunn, aided by Vishy Anand will look into the night sky using a telescope in Australia. Details and full pairings. Ever wondered how to get the most out of your Fritz or ChessBase software, now here's your chance. Resident ChessBase expert Nick Murphy will demonstrate and many useful functions and tools available in the world's most popular Chess software. Nick, sometimes also known as "Nick the Geek" will also be on hand to answer any questions from the audience. Documentary: "Bobby Fischer Against the World"
Special screening of 'Bobby Fischer Against the World' in the very same auditorium that the world's best players will be playing in. If you're a chess fan and haven't had a chance to see this film in the cinema yet, here's your chance. Bobby Fischer Against the World traces the grandmaster from child prodigy to Cold War hero to controversial recluse. Cutting interviews with Bobby and the people who knew him, with footage and news reports, Bobby Fischer Against the World is a mesmerising portrait of the rise and bizarre fall of one of the great American icons. From veteran filmmaker Liz Garbus, and the final project of late editor Karen Schmeer, Bobby Fischer Against the World exposes the disturbingly high price Fischer paid to achieve his legendary success and the resulting toll it took on his psyche. Rare archival footage and insightful interviews with those closest to him expand this captivating story of a mastermind’s tumultuous rise – and fall. Official website. At 6.30 join us for a fabulous trip to the edge of the galaxy and beyond with a group of chess-playing amateur astronomers. First Grandmaster Dr John Nunn will show and talk about some of his award-winning astronomical images, taking you through star clusters, stellar nurseries, supernova remnants and on across millions of light-years to distant galaxies. John Nunn showing a picture of the Crescent Nebula in the constellation Cygnus. Since retirement from active chess John has developed an keen interest in astronomy. Then Dr Christian Sasse from Vancouver will explain the technology behind these remarkable images and show how, thanks to the Internet, it is possible to control telescopes on the other side of the world in real-time. Finally (provided he has finished his preparation), World Champion Vishy Anand will give a hands-on demonstration, operating a telescope in Australia and, weather permitting, taking an image of one of the astronomical highlights of the Southern skies. Here are two of the images Dr Nunn will be talking about. They were taken with the Global Rent a Scope (GRAS) telescopes that he and Vishy Anand will be operating on the free day. 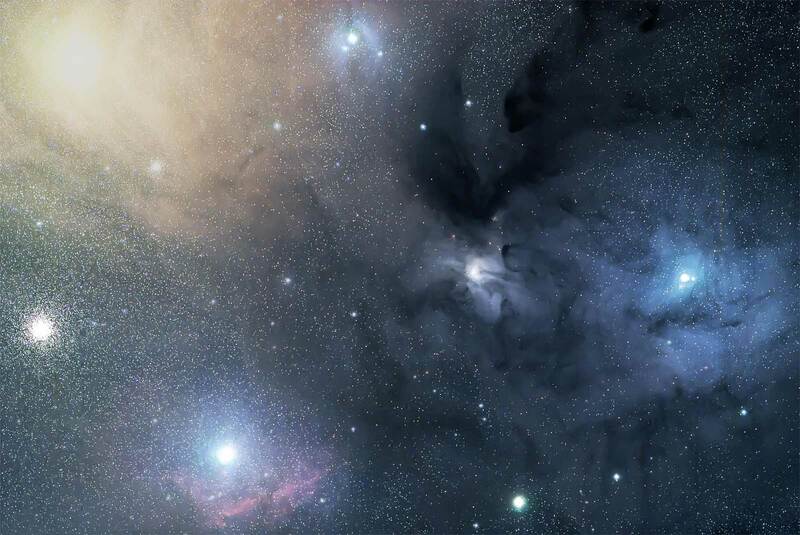 The Rho Ophiuchus cloud complex (click image to enlarge) is a dark nebula of gas and dust located in the constellation Ophiuchus. At an estimated distance of 430 light years it is one of the closest star-forming regions to the Solar System. The cloud has about 3,000 times the mass of the Sun in material, and it contains many young stellar objects, including protostars and stars with dense circumstellar disks that have estimated ages ranging from 100,000 to a million years. 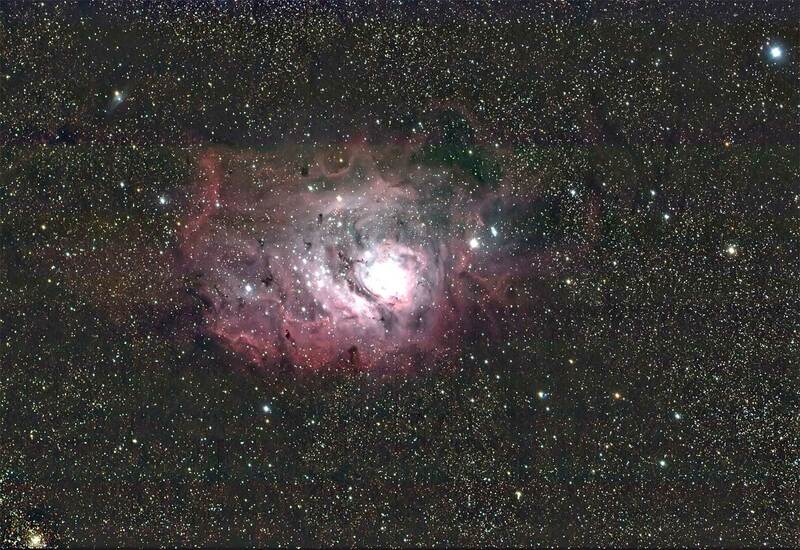 The Lagoon Nebula (click to enlarge) is a giant interstellar cloud in the constellation Sagittarius. It was discovered in 1747 and is one of only two star-forming nebulae faintly visible to the naked eye from mid-northern latitudes. Seen with binoculars, it appears as a distinct oval cloudlike patch with a definite core. The Lagoon is between 4,000 and 6,000 light years from the Earth and is one of Vishy Anand's favourite star-forming nebulae. Special event: Garry Kasparov Book Signing! The great man himself will be signing copies of his newest book: "Garry Kasparov on Garry Kasparov Part 1: 1973-1985". The book will be on sale at the tournament bookstall or you can order a copy in advance by clicking here. Monday 5th and Friday 9th December, 5 p.m.
Victor will be giving two simultaneous displays during the London Chess Classic on Monday 5th and Friday 9th December. Limited places – 25 board max per simul! Who can play? Anyone can take part provided your Elo is below 2300. Entry fee: £50. Time: Play starts at 5 p.m. Please note that entries can be made by phone, online or post. Call the ticket hotline 0207-388-2404, apply by post to Chess & Bridge Ltd., 44 Baker Street, London, W1U 7RT or click here to proceed with an online purchase. Full information on the simuls is here. For clarification: As the lowest rated player has pairing number 7, according to the tournament regulations, the round this player has the “bye” has been moved to be played as round 9. All games start at 2 p.m. or 14:00h British time = 15:00h CET, 17:00h Moscow, 7:30 p.m. Chennai, 22:00h Beijing, 01:00 a.m. Melborne, 03:00 a.m. Auckland (sorry Murray! ), 6 a.m. San José, 9 a.m. New York. You can check your location here. Naturally the games will be covered live on the official web site (below) and on Playchess. Stand by for further details on Saturday. The games of the final round start two hours earlier.